Easy check in/out of crew and cast. Export a spreadsheet to payroll. Check in and out your crew and cast. Record their working hours. Note sick days and other absent days. Export records to a .csv file to import to the spreadsheet application of your choice. All in an easy-to-use interface! 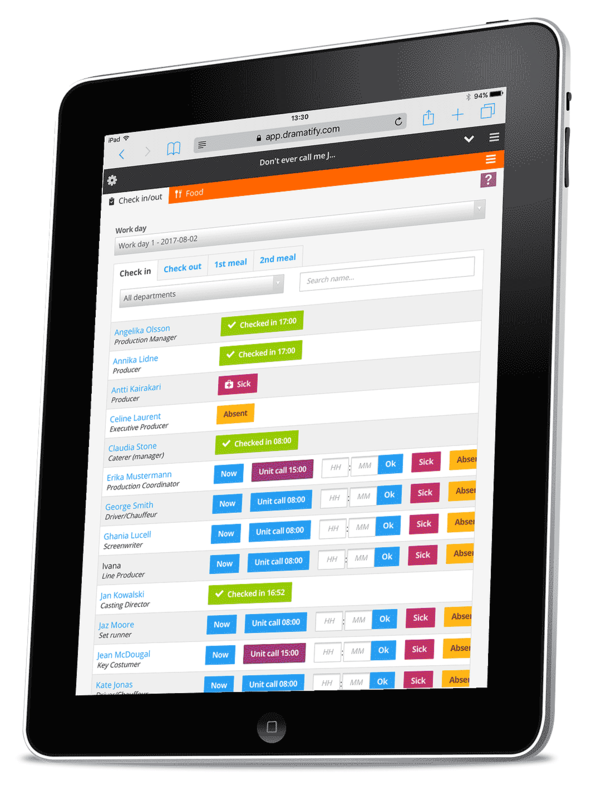 Time sheets and the check in / out of working hours are integrated with our production teams, the scene scheduling, crew scheduling, the daily cast scheduler, call sheets and food management. It lets you check in your cast and crew on set as well as record sick days and absence. You can check in/out your team members both on the set call times as well as customised times so you can adapt the time recording to your specific production needs. After wrap, you can export the day’s time sheets to payroll as a .csv file to import into the spreadsheet program of your choice. This export can also include meal times and plate count from our food management feature. Nifty, right? Top image by Peter Burka / Flickr (CC BY).